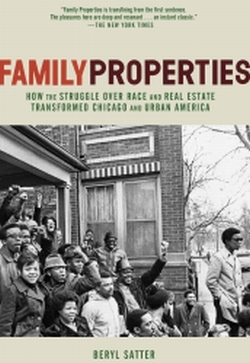 In her new book, Family Properties: Race, Real Estate, and the Exploitation of Black Urban America, historian Beryl Satter puts a human face on the often told story of racial discrimination in urban housing by following the career of her father, Chicago attorney Mark J. Satter, who was both an ardent defender of his mostly black clients who had been severely exploited by real estate speculators, and a property owner in an increasingly black neighborhood who some later accused of being a slumlord himself. Her account is a cautionary tale that reminds us that the ghettos of America’s largest cities are the consequence of large impersonal economic forces and of hundreds of individual decisions driven by self-interest and, on occasion, by selfless motives as well. Family Properties deals with one of the most contentious questions of recent American history –- why so many urban neighborhoods changed so rapidly from white to black, and then decayed into slums. Yet the book originated in something very personal — my curiosity about my father, Mark J. Satter. He was a Jewish Chicago attorney with a largely black, working-class clientele. He was 49 years old when he died from a heart ailment in 1965; I, the youngest of his five children, was six. As I grew older, I picked up oddly mixed messages about him from my relatives. They told me he had been a well-known crusader for the oppressed. But they also spoke in more whispered tones about properties he had owned in what was now a black ghetto. He’d hoped that they would provide for his family. Instead, they had become worthless. They were sold shortly after his death. By then they were worth so little that their sale hadn’t even covered that winter’s coal bills — and I understood that somehow, my relatives felt that he was to blame. I was shocked by the stories they contained. I learned that my father had represented scores of African-Americans who had been unconscionably mislead and grossly overcharged by the real estate agents they’d turned to for help in buying homes. A typical example: in 1957 a white real estate agent, Jay Goran, bought a building for $4300. Soon after, Goran sold it to a black couple, Albert and Sallie Bolton — for $13,900. Goran never told the Boltons that he was actually the building’s owner. The Boltons signed some complicated documents that said that the building would remain the legal property of its current owner until they paid off the property in full. They made their high monthly payments for a year; they also spent a considerable sum for repairs. Then they missed a payment, and were evicted. Goran was now free to resell the property, keeping all that the Boltons had invested in it. In part, the Boltons lost their home and their savings because of the policies of the Federal Housing Administration, which redlined — that is, refused to insure mortgages — in neighborhoods that contained even a few black residents. As urban historians have shown, FHA redlining made it impossible for most African Americans to buy homes with a mortgage. Instead, they were forced to deal with speculators, who bought low from whites and sold high to blacks. But these historians missed a critical point. Given that blacks could not get mortgages, how were they able to buy high-priced properties? The trap that caught my father’s clients provides the answer. Unable to get a mortgage, the Boltons bought their building “on contract,” that is, on an installment plan. They made a down payment. They were also responsible for taxes, insurance, maintenance, and interest. However, they couldn’t get title to the building until the purchase price had been entirely paid off. With just one missed payment, the speculator could reclaim the building. If housing prices were inflated, a missed payment and subsequent quick eviction was practically guaranteed. And prices were wildly inflated. Speculators routinely sold to African Americans at double their properties’ values, but sale prices of triple to quadruple the properties’ values were not uncommon. The fact that approximately 85% of the properties sold to black Chicagoans were sold on contract – and that there were close to a million black people in Chicago by the mid-1960s – gives a sense of the scale of the exploitation. Why were black Chicagoans willing to buy overpriced properties on contract? Consider the fact that between 1940 and 1960, Chicago’s black population almost tripled, from approximately 278,000 to 813,000. Most were squeezed into the South Side Black Belt — a neighborhood that had been severely overcrowded even before World War II. Essentially, they were trapped. While homes were for sale at decent prices in nearby white areas, black people could not get mortgages to purchase property there. Landlords in surrounding white neighborhoods usually refused to rent to them as well. Those few black families who did escape the South Side ghetto and move to a less crowded white area were often attacked by their white neighbors, who would mass in front of their home, breaking windows and shouting death threats. At the same time, black incomes rose nationally in the 1950s; the rise was particularly pronounced in Chicago, where tens of thousands of middle-income black people were paying high rents for inadequate spaces in the South Side Black Belt. Given this context, when a contract seller offered them housing outside of the ghetto, it made sense for them to grab it. Although the prices that the contract sellers charged were high, monthly payments often weren’t much higher than the rents that black families were already paying. Given the redlining policies of the FHA, buying on contract was one of the only means of escape from the high-rent, overcrowded ghetto. But that didn’t mean that contract sellers weren’t wreaking havoc, fomenting racial division, and exploiting their black customers. “Blockbusting” contract sellers terrorized whites by going door to door, telling homeowners that “the blacks are coming.” If a white person’s house was worth, say, $8,000, they’d offer $7000 – adding that if the homeowner didn’t want to sell, the speculator would be back in month, but this time would offer $6500 – and if that wasn’t adequate, he’d offer the homeowner $6000 shortly after that. Facing this kind of pressure, the white homeowner would sell to the contract seller at $7000 – and the contract seller would then sell that property, on contract of course, to a black buyer – often a person of middle-class income – for, say, $15,000. But even for a middle-income person, being forced to pay double or more than a property was worth hurt. In addition to being grossly overpriced, the buildings that contract sellers sold were often riddled with code violations. Some black buyers managed the payments and the high repair costs – others did not. And remember, if a contract buyer fell behind on even a single payment, he or she was out – the property reverted to the contract seller, who would resell it to another victim. What happened to “racially changing” areas where contract sellers were active? While contract sellers became millionaires, their harsh terms and inflated prices destroyed whole communities. Because black contract buyers knew how easily they could lose their homes, they struggled to make their inflated monthly payments. Husband and wives both worked double shifts. They neglected basic maintenance. They subdivided their apartments, crammed in extra tenants, and, when possible, charged their tenants hefty rents. Indeed, the genius of this system was that it forced black contract buyers be their own exploiters. The resulting decline of racially changing areas fed white racism. White people observed that their new black neighbors overcrowded and neglected their properties. Overcrowded neighborhoods meant overcrowded schools; in Chicago, officials responded by “double-shifting” the students (half attending in the morning, and half in the afternoon). Children were deprived of a full day of schooling and left to fend for themselves in the after-school hours. These conditions helped fuel the rise of gangs, which terrorized shop owners and residents alike. Ultimately whites fled these neighborhoods not only because of the influx of black families, but also because they were upset about overcrowding, decaying schools, and crime. They also understood that the longer they stayed, the less their property would be worth. My father’s immersion in the heartbreaking details of his clients’ lives led him to embark on an impassioned crusade against Chicago’s real estate speculators – and against the white professionals, mortgage bankers, and politicians who enabled those speculators to thrive. He tried numerous cases against the city’s worst contract sellers, and gave countless speeches to any group that would listen denouncing their practices. At the same time he was also managing his own properties, four buildings that he had purchased in the 1940s and 1950s. All were located in Lawndale, a formerly Jewish neighborhood (my father was born and raised there) which was rapidly becoming black, and which also contained a high concentration of overpriced contract sales. It was ironic but not surprising, then, that as my father urged others to protect their investments, his own deteriorated. He poured his money into maintaining the properties, but eventually it became nearly impossible to find either honest building managers or responsible tenants. His building managers stole from him. Some of the tenants they let in severely vandalized the property. The repair bills grew higher until they wiped him out financially. Indeed, as my brother David later told me, that my father was “caught in his own trap.” When he rented to black tenants, he was called a “blockbuster.” If he were to refuse to rent to them, he would be a racist. Given his public posture, my father could not sell his buildings as blacks were beginning to move in; that would make him a hypocrite. If he sold after the neighborhood had become all black, he’d find no buyers except the speculators he was denouncing. Of course he would not participate in the plunder engaged in by these men and women. He decided to hold on, and try his hardest to maintain his properties while the surrounding area crumbled. But if his efforts to maintain them failed, then he was a slumlord. If tenants damaged the buildings, he would be called a slumlord as well. Although the ironies were greater, my father’s situation differed little from that of any other white landlord in a “changing” urban neighborhood. Their choices were 1) to become contract sellers themselves; 2) to sell their property to a real estate speculator; or 3) try to “do the right thing” – that is, do what the liberals were preaching and stay in the neighborhood. But more often than not that meant to watch as one’s neighborhood became overcrowded, neglected, and crime-ridden, and to watch in horror as one’s property decline dramatically in value – until, defeated at last, the remaining whites exercised the one option that many of their black neighbors did not have – the option to leave. I had thought that my father’s untimely death in 1965 was also the tragic end of the battle against exploitative contract selling in Chicago. I would learn, however, that the battle he’d tried to ignite did finally take off — but only after his death, when a black-led community organization called the Contract Buyers League arose to battle that practice. The struggles, losses, and ultimate triumphs of Chicago’s black contract buyers was a gripping drama that my father’s story led me to uncover, and one that would grant a measure of closure to what I had initially believed to be the tragedy of my father’s lonely battle. The above material is adopted from “Race and Real Estate,” a précis of Family Properties that was published in the July/August 2009 issue of Poverty & Race, the bimonthly publication of the Poverty & Race Research Action Council in Washington D.C. (www.prrac.org) and from the book Family Properties: How the Struggle over Race and Real Estate Transformed Chicago and Urban America by Beryl Satter. Copyright © 2009 by Beryl Satter. Reprinted by arrangement with Metropolitan Books, an imprint of Henry Holt and Company LLC. Books, an imprint of Henry Holt and Company LLC.